It is a dangerous, addictive white powder that can be found in abundance throughout this country. It is not illegal. In fact, it is available near playgrounds, schools, and workplaces. It is in practically everything we eat and drink, and once we are hooked on it, the cravings can be overwhelming. This white substance of abuse is sugar. Over two decades ago, Nancy Appleton’s Lick the Sugar Habit exposed the health dangers of America’s high-sugar diet. 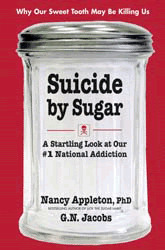 Now, in Suicide by Sugar, Appleton, along with journalist G.N. Jacobs, presents a broader view of the problems caused by our favorite ingredient. The authors offer startling facts that link a range of disorders—from dementia and hypoglycemia to obesity and cancer—to our growing sugar addiction. Rounding out the book is a sound diet plan along with a number of recipes for sweet, easy-to prepare dishes—all made without sugar or fruit. Suicide by Sugar shines a bright light on our nation’s addiction and helps us begin the journey toward health.